Home / Entertainment / Why is Concert Lighting Important? Why is Concert Lighting Important? Going to a concert that is performed in the dark would be insane. Sure, sound is important, but the experience is incomplete without proper lighting. Concert lighting is one of the greatest attributes of the theatrical and entertainment industry. It is what separates a good concert from a memorable one. As any professional in the AV business will tell you, there are many things that affect a concert experience. However, the main objective is to make the audience feel a part of something bigger. A good lighting design allows them to be immersed in the event. Those experiences that are created when everything around you comes together tend to stick in your mind and heart. That’s because the mind attaches emotions to it and then transforms into a valuable memory. In order to achieve this, all aspects from brightness to color theory needs to be taken into consideration. Changes in visual dynamics and altering light patterns can create shifting emotional moods and increase public engagement. You’ve all heard the phrase, “Seeing is believing.” But anyone who’s been to a concert will tell you that “Seeing is feeling.” With today’s technology, concert lights not only enable the viewers to see what is going on, but they also affects their mood. Lighting helps build a connection between the audience and the artists on stage. It influences how interactive the crowd is with the performance. Concert lights can offer a variety of coverage from soft, diffused ones to highly focused spotlights to pulsating strobes. Any light source can further be altered with the aid of adjustable shutters to control the “throw” of light, create a colored effect with the use of colored gels, or by inserting a sheet with a design cut into it to project a picture-like effect on stage. The most extravagant result of any lighting scheme is created through the implementation of LEDs. And the greatest advantage is that they offer an alternative to the typical sources that give off tremendous amounts of heat. Lighting directors have been able to utilize different LEDs to create unique experiences. Through the use of colors, they can establish the identity of individual groups, representing specific combinations to link a band’s genre and taste. During the performance, the lighting director must set the basic mood for each song. Throughout the concert, he must ensure that the lighting varies according to the music on the playlist. The key purpose of stage lighting is to create anticipation. The audience should be able to envision what the music is going to do. The lighting director should be able to feel the changes in the music before they happen. Any change in the music is then translated to a shift in lighting so that it happens in unison. In that moment, the music and lights truly become one. As a song continues, it often becomes more exciting, so the lights must change in time with the music. As both increase in energy levels, so too does the crowd. The lighting director can intensify excitement by highlighting moments such as downbeats or when the song moves through different parts like the verse or chorus. The thought of a concert conjures images that are saturated with sound and color. Bright yellow sidelights supplemented by strong red backlights can escalate the visual excitement. But various hues can also intensify the atmosphere, such as cool white spotlights, pulsating cyan and magenta, etc. Ideally, each performance needs to be unique, so a lot of careful planning is required to attain the best outcome. The techniques often concentrate on illuminating strategic points on stage while punctuating the music with heavy color or intensity. Most importantly, the light director aims to express the same emotion conveyed in the lyrics. He may employ color filtering or moving lights to heighten the dramatic visual impact. In effect, the lights strive to enhance what the singer is saying. 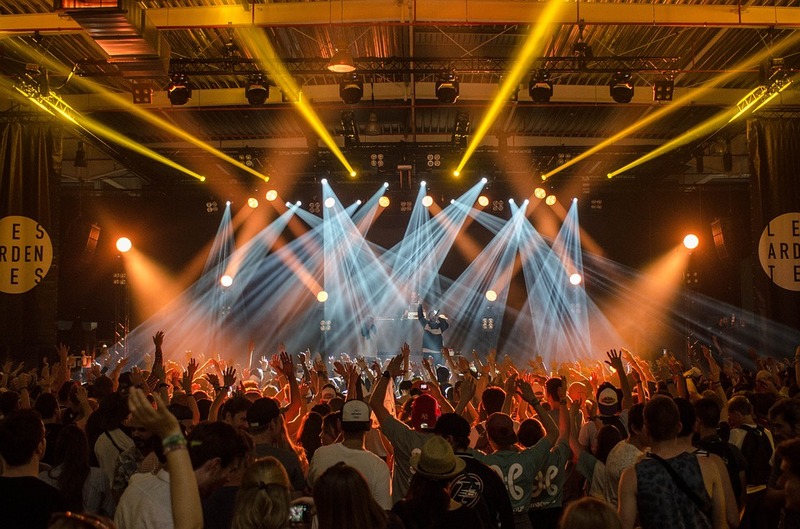 Therefore, with proper usage, concert lighting has the capability to encompass the entire arena as it captures the mood and the vibe of the song. Lighting typically involves manipulating four major aspects of a light source. Intensity: It can vary from near total darkness to being painfully bright. Movement: This refers to the changing direction of the light, but it can also include intensity and colour. Colour: Any colour can be created through the use of lighting gels or by mixing shades. It has a significant hand in setting the mood. Direction: This refers to how the light approaches the stage. It can come from below, directly above the stage, or anywhere in between. The light source on stage can originate from behind, in front of, or to the side of the performers. Each combination produces a unique effect. The next time you attend a concert, conscientiously think about the lights. Though visibility is the primary function of concert lighting, spotlights or hazers can form a selective focus by forcing you to look where the light is pointing. Similarly, strategically placed lights throughout the concert arena can create different effects. All in all, they aim at developing a mood that matches the atmosphere of the concert. And these lights can guarantee that you have a mind-blowing experience.